¶ Part of any good rebuild is a valve job. 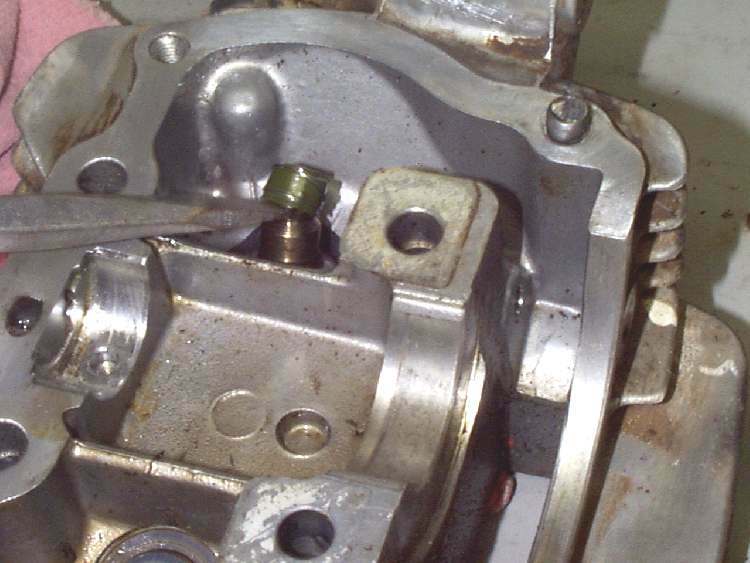 If the valves leak, the engine will just not run right. So we want good valve seats. How do we get them ? Let's just start from the top. 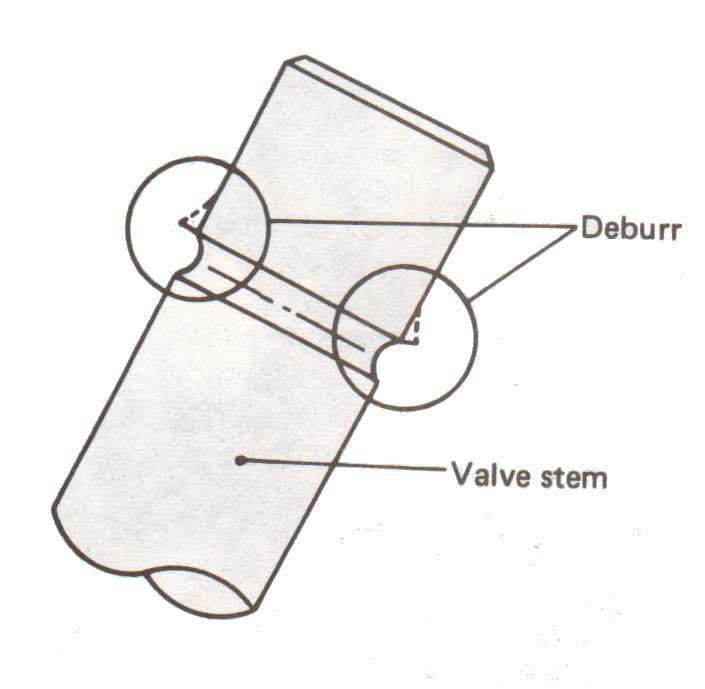 First look at the end of the valve and how the valve keepers fit around the valve stem. Things should look like this when you finish. This is how I remove the valve keepers. It sounds wild, but it works great. Take the head, put shop towel in the combustion chamber and turn it over so the valve ends are up. 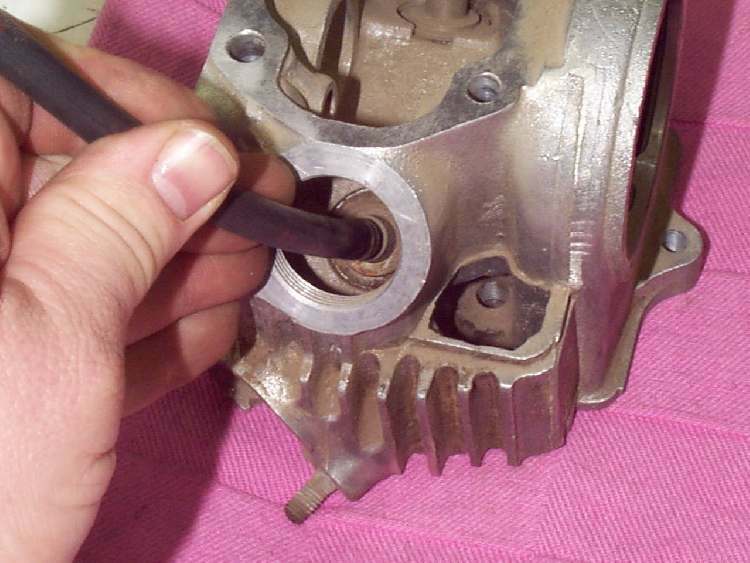 Take a deep well socket that is the same diameter as the valve spring cap, and put a little ball of wadded up paper in the square end. This will keep the valve keepers from popping out. Now take the socket and put it on the valve with the square end up. 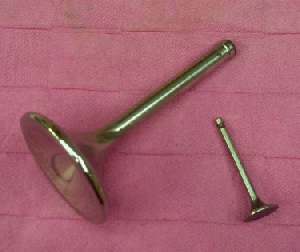 With it centered and square on the valve spring keeper cap, hit it sharply, but not too hard, with a hammer. The two valve keepers will fall out and you can take the spring cap and springs off the end of the valve. This sounds quite radical, but it works great, and if done right will not hurt anything. 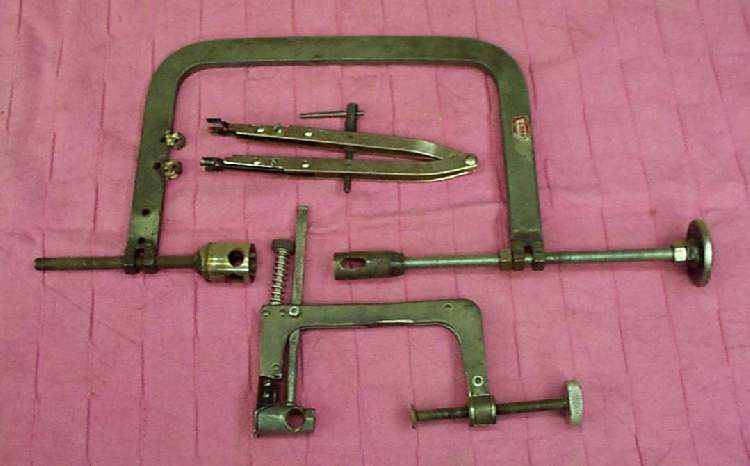 If you are uncomfortable with this, use the valve spring compressor, but that is a lot more work and more chance of loosing parts. I always mark everything so you can put everything back in the same position. Use an eggcrate for this. At the very least keep exhaust parts with exhaust parts and intake with intake. Measure the height of the springs, and if they have settled, and are short, replace them. Lots of times there is a thin metal washer under each spring. It can also be a fairly thick spring base. It is sometimes hard to tell if there even is a washer. 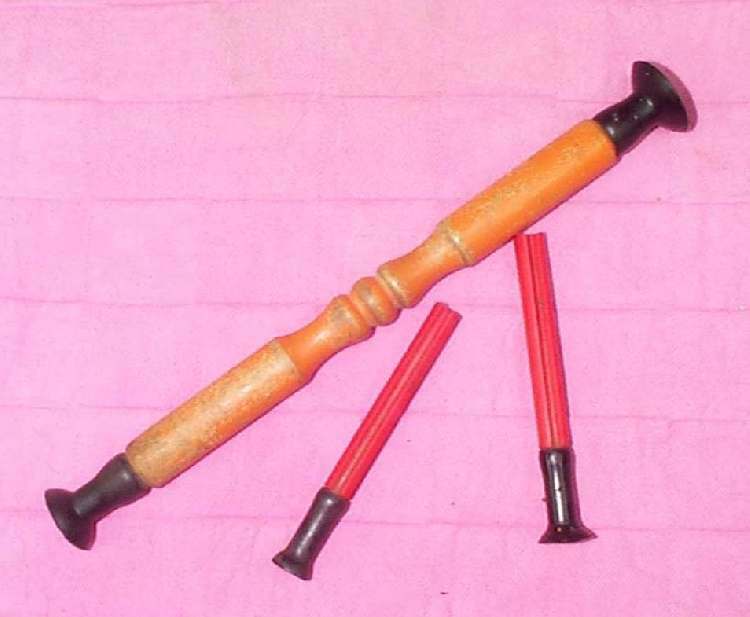 Clean the spring seats with some solvent and then blow with compressed air. That will usually pop the washers out. If you don't take them out they will fall out when you least expect and get lost. If you leave them out and the spring is right on the aluminum, it will wear into the head, but not all that fast. Still, make sure they are in there. Things will work better, longer. Now push the valve out, and gently pry the valve seals off, if there are any. Seals are a nice thing, but if there are none or they are worn, it doesn't seem to be that big of deal. Like a car can pump a lot of oil if it has bad seals, but Air cooled bikes don't seem to, kinda sorta. I would still put on new if at all possible. They are cheap, so why not ? 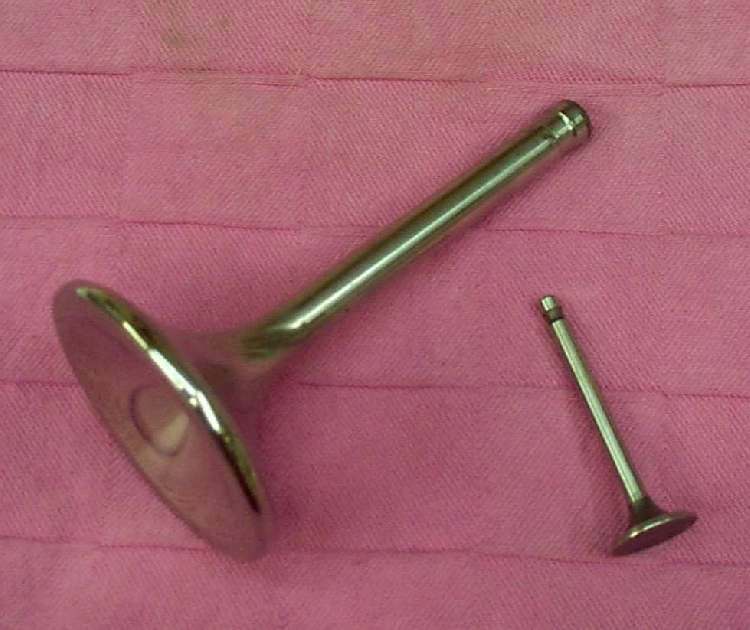 If the valves are stuck in the guides, you may have to drive them out with a punch. If the valve is just catching on a bit of metal knurled out of the valve by the valve keepers, you can take a small file and file it down so the valve will slip through the guide. Pull the valve out a bit and wiggle it back and forth. 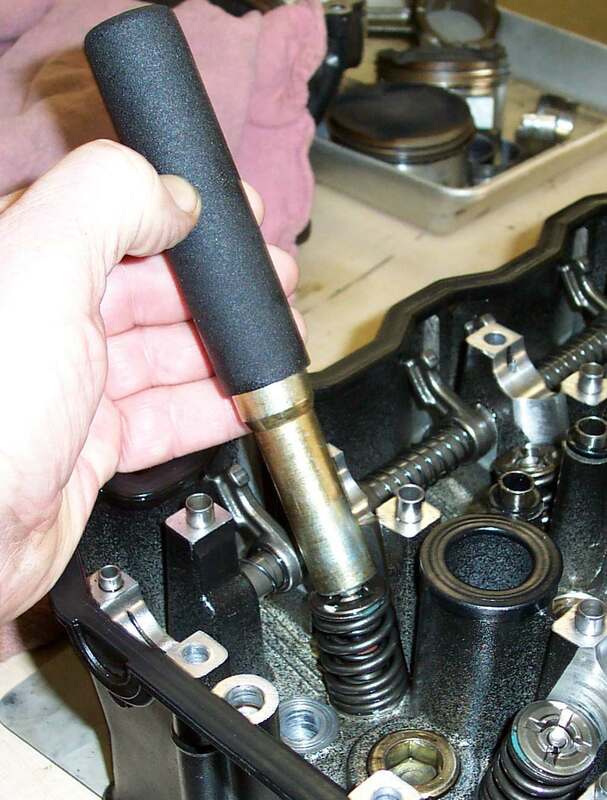 A little play is usually OK, but if there is too much play you will have to replace the valve guide. Check your shop manual for the maximum amount of play. I don't replace many valve guides. Usually they are OK and often the machines are old and don't warrant the expense. You will have to make the decision yourself. If you need to replace a guide, and have an aluminum head, put the new guides in the freezer for a couple of hours. Heat the head up to about 300 degrees and drive the old guide out. Then quickly drive in the cold new guide. After the head has cooled you will need to ream out the guide to the right size. The seat must be recut too. The guides on iron heads may be driven out cold. I always use new valves unless the valves are very big. 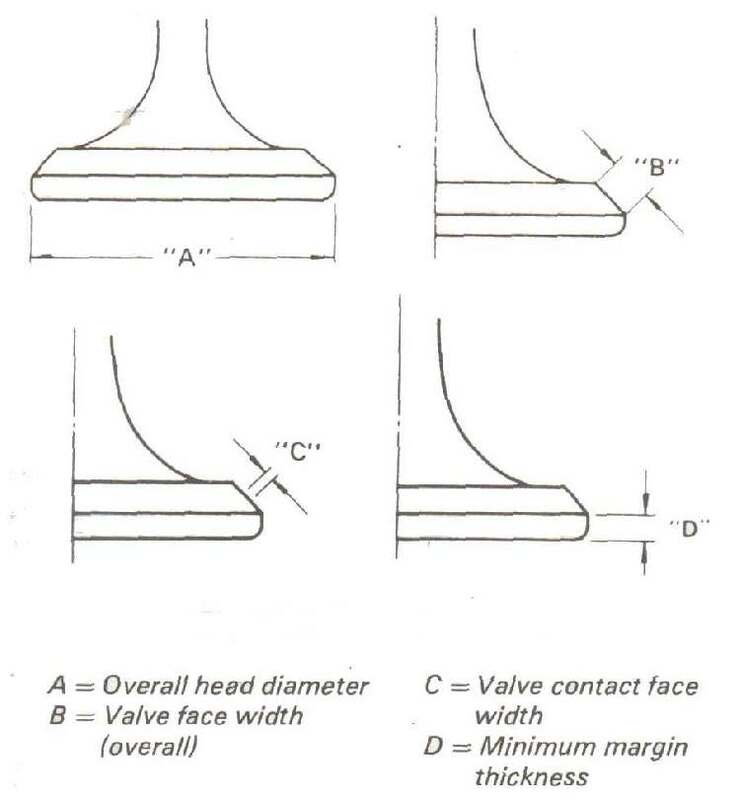 Most valves are stellite coated (or something like it) and that coating can be very thin. If you attempt to grind them on a valve grinding machine you might cut through this coating, and then again maybe not. I tried it once on a 4 valve CB750 Honda. It did work... sort of. It took over 1000 miles of running before the valve clearances stabilized. I decided I didn't want to do that again. So now it's all new valves for me. At least on the small bikes and four valve engines. 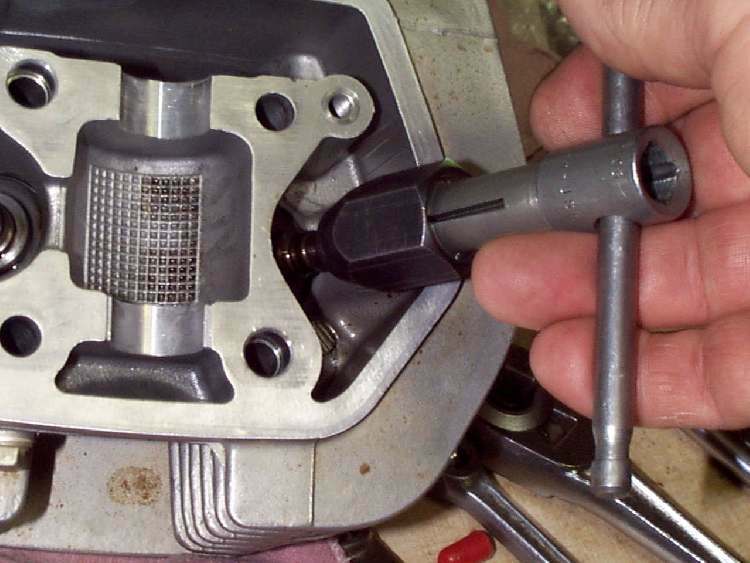 If the valves are big, like on a Harley or other big, two valve, twins it's OK to grind them. 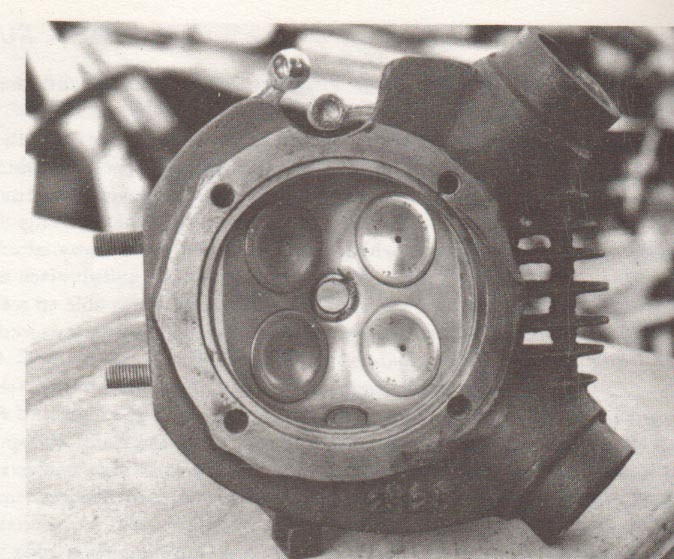 Speaking of 4 valves, I'll bet you think that is a recent innovation. If you do, you would be wrong. The English Rudge of 1929 had a 4 valve head. 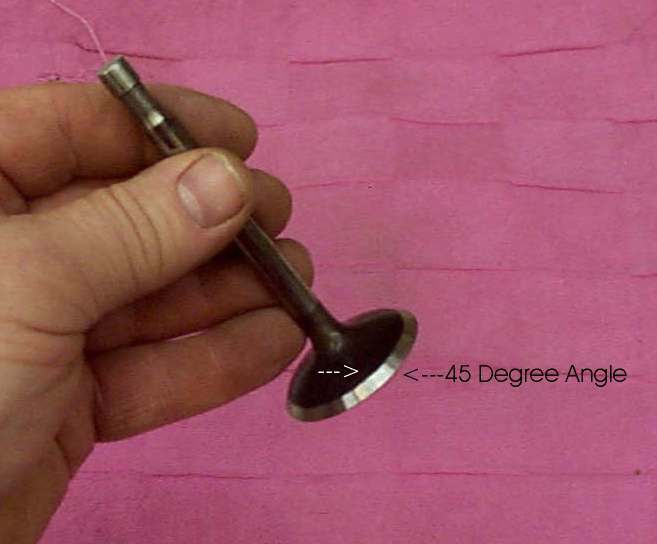 If you do re-grind the valves make sure the edge of the valve is not sharp or thin and is the correct angle. If it is thin, the valve will overheat and fail. Now we come to the seats. 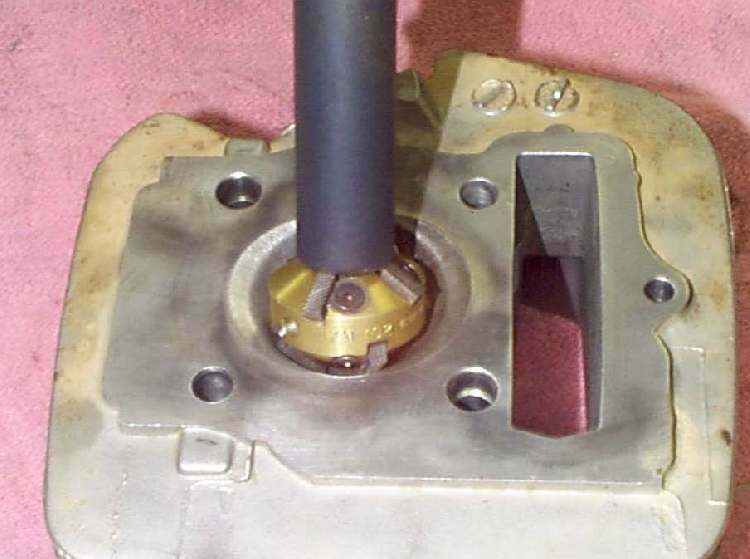 You will need to cut or grind the valve seat, at the correct angle, until it is smooth. That angle is usually 45 degrees. 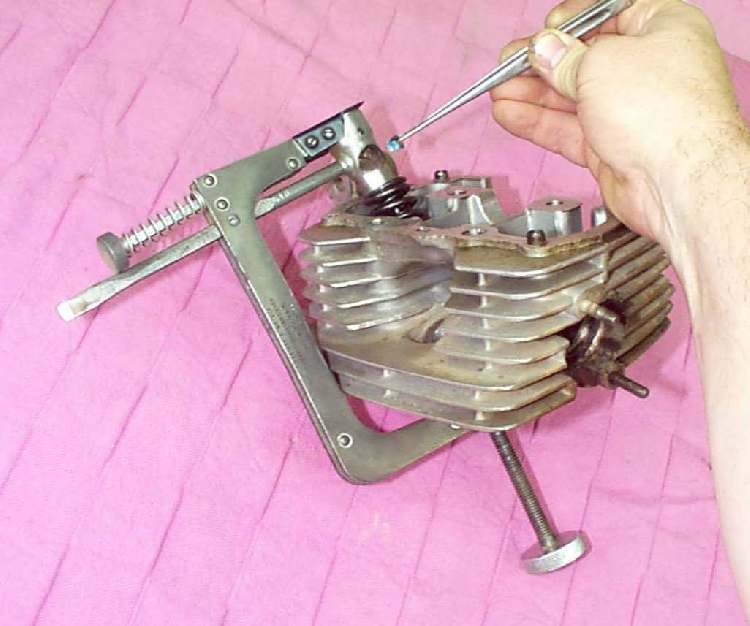 Some small engines use 30 degrees, but most motorcycles use 45 degrees. The tools can be quite expensive for a full set. 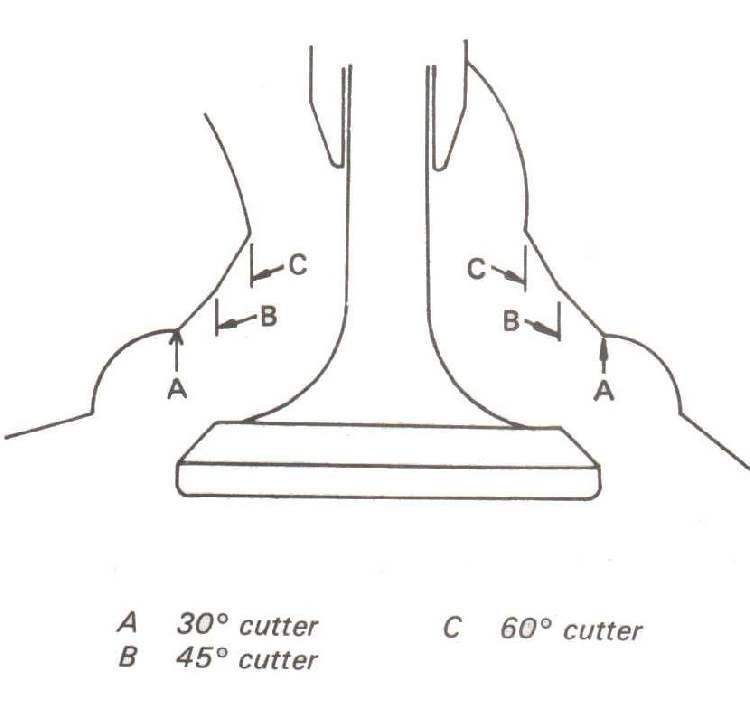 Now the correct way is to cut the 45 degree seat then position it with 15, 20, 60 and 75 degree cutters and make the seat the right width. 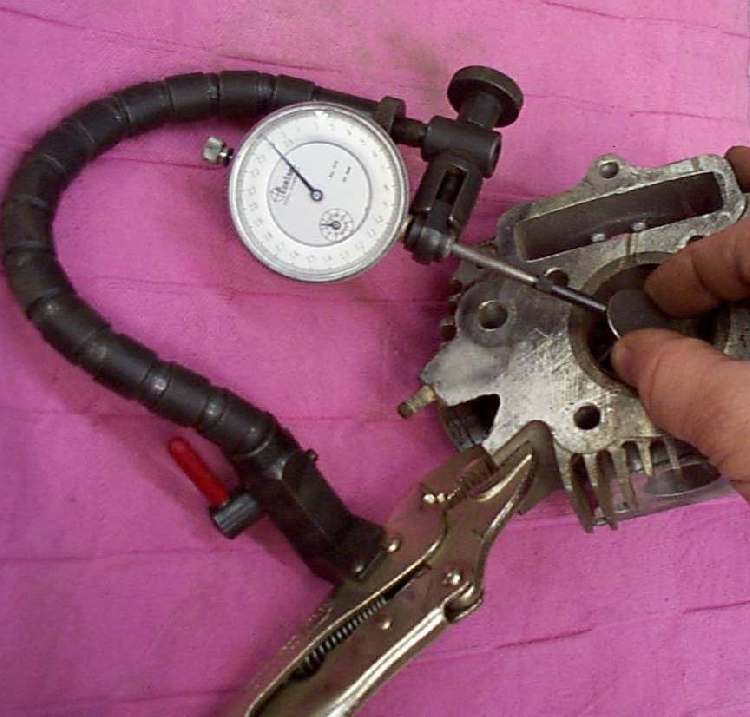 Some cutters are set at 46 degrees so the valve and seat will kind of work themselves together. They tell me this is the best way, and I suppose it is. If the engine you are working on, must have the very highest horsepower or is one that's going to last awhile, like a BMW, I think cutting the seats this way is beneficial. However, I feel a good smooth 45 degree seat with a new valve will work just fine even with a wide seat. I know an old line car mechanic who never thins or postions the seats on any engine he rebuilds and they all work just fine and in 50 years he's done a lot of engines. If you just want to cut it and lap that sucker in, I have no problem with that. If you want it "just so", well, I have no problem with that either. It just costs more money. I once had a 5 angle valve job done on my BMW. At the time I was running my bike pretty hard. If there was any horse power boost I would have noticed, but there was nothing. Now I'll bet some great, valve master out there will say I'm way, bad, wrong, but I actually think a wide seat might be a good thing. 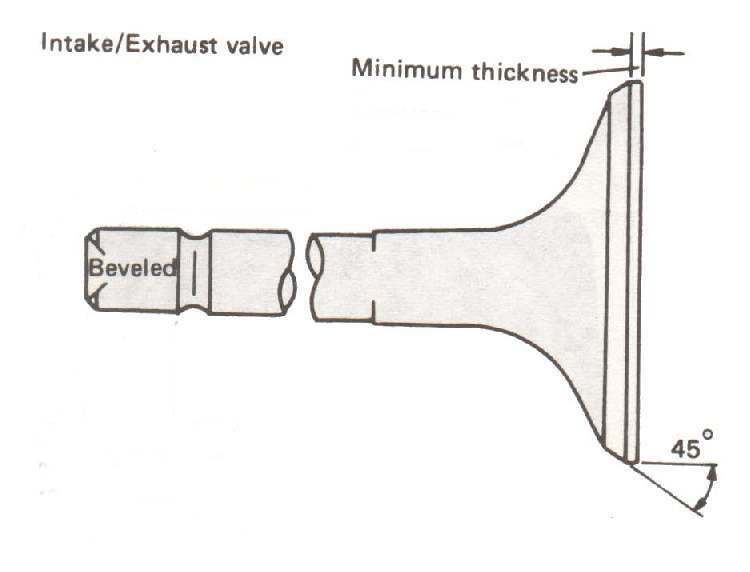 Most of a valve's heat loss (Cooling) occurs when the valve is on its seat. Very little heat escapes through the stem. Seems like the wider the seat the better the cooling. Perhaps this lessens the horse power. Instead of 185 MPH you now can only go 172. Perhaps this matters to some, but about 99 and 44/100 % of the riders I know can't really use 75 % of the horse power of their machines, let alone 100%. Considering the maintenance schedules most people use for their bikes, a bit more cooling, on a hard working valve, might be a good thing. Anyway, either take it in to someone or do it yourself, but one way or another get a good, smooth seat. 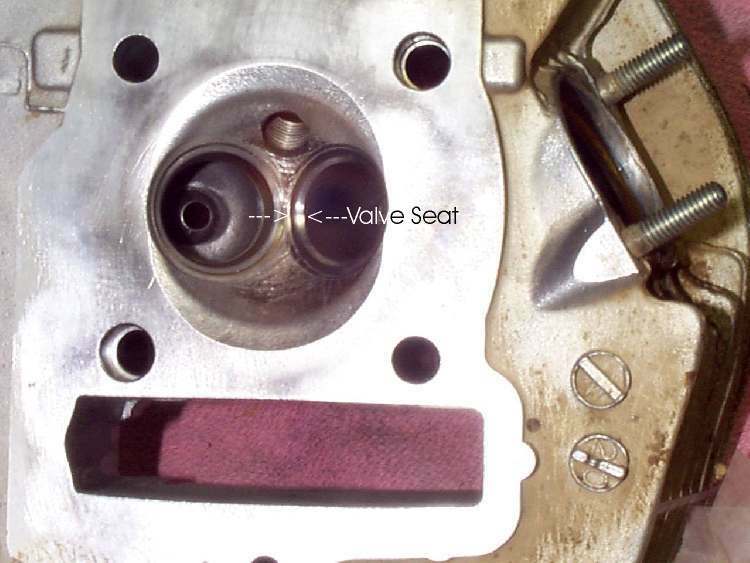 If the seat angle and valve angle are perfect you don't really need to lap the valve in with valve lapping compound. I still like to do it and get a nice matte finish all the way around the valve. 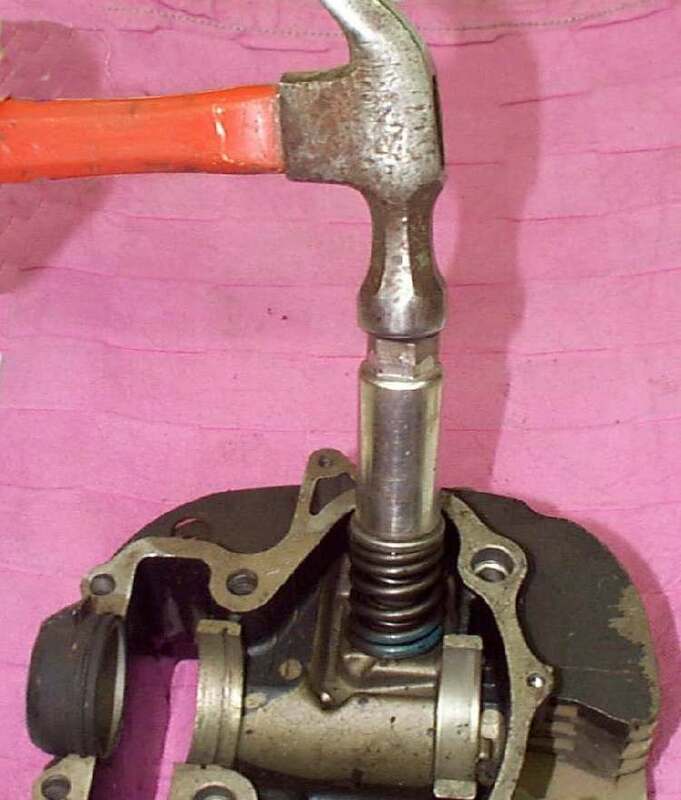 There are many ways to lap in a valve. They make several types of special tools that press down on the valve and turn it. I like to use a piece of hose on the end of the valve so you can apply pressure and turn the valve at the same time. You will want to turn the valve back and forth, lifting the valve every once in a while to distribute the grinding compound. 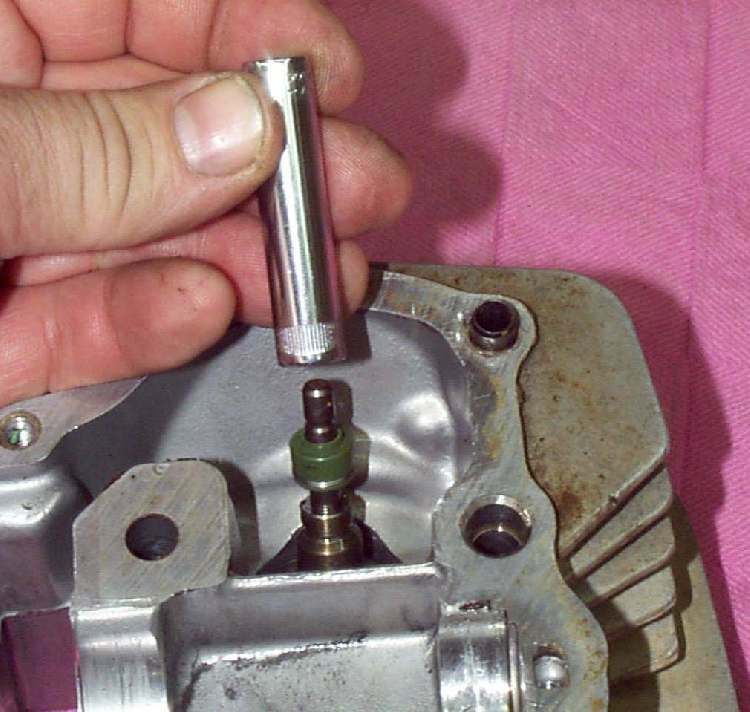 Pressing down from the top of the valve with a tool doesn't seem to always work on small motorcycle valves. Sometimes I can get a tap handle on the end of the valve and this works quite well too. 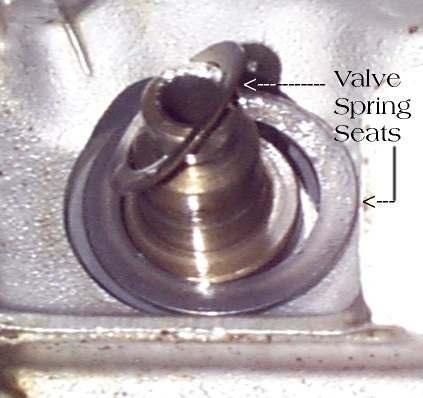 If you can't afford new valves it is possible to lap and grind and grind and grind and eventually smooth up the seat enough to make it work OK. If it's an old cheap bike, and you're poor, and you have a lot of time, it might get you back on the road. Just something to consider. Resist the temptation to stick the valve end in a drill and really lap that sucker in. You need to go back and forth and back and forth. You want the finish to be a nice matte finish with no lines in it. OK, we got new valves, cut the seats and cleaned everything up real good, including the intake port. Next, I like to put some valve lubricant on the valve stem. I use the stuff Briggs and Stratton Engines sells. Watch out. It contains lead. Bad stuff. Or so they would have us believe. Anyway, put some on the stem and put the valve in the guide. Put some oil on the steel shims for under the valve springs and put them on before the valve seals. Put some lube on the valve seals and push it on the end of the valve. Push it down to the guide, then on to the guide with the right sized, deep well, socket. Now put the valve springs and cap on. 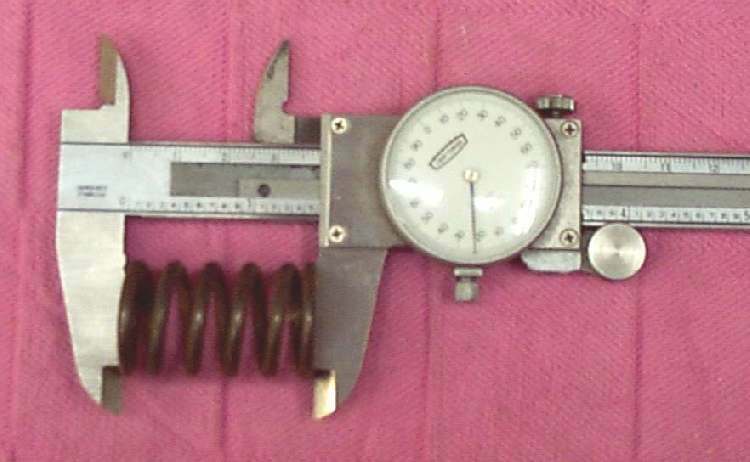 Carefully compress the springs with a valve spring compressor. I always wear some kind of eye protection like glasses or goggles, just in case the compressor slips off the springs and everything goes into orbit. I also use a pair of long tweezers and a long needle to place, ease and wiggle the valve spring circlips into place. Put a bit of grease on each keeper to help hold it in place. There are two of them. You might need to modify the compressor to make it fit right, and/or work, better. It will help to cover the whole thing with a shop rag if you have to move it around for any reason. Like reaching for another tool or something. This may sound strange, but if the tool slips odds are most everything will be caught by the rag. You would think one could find small valve parts easily on a cement floor... but you would be wrong. But, as always, if you don't... I don't care. Their not my valve parts. Motion Pro has a tool to install the valve keepers and it works great. It's a bit pricy but after using it once you'll agree it's worth every penny. Last thing. We want to test our work. Turn the head so the combustion chamber is up and level. Fill the chamber with solvent or gas. Let it set a minute or two and then shine a light up the exhaust and intake ports. Look for leaks or wetness. There should be none. If there is, take the offending valve back apart and relap it. Then put it together and test it again. The solvent will find the slightest leak. We want NO leaks. One more last thing. When you assemble the engine make double sure to clean the intake manifold, carburetor throat, and air cleaner tube. 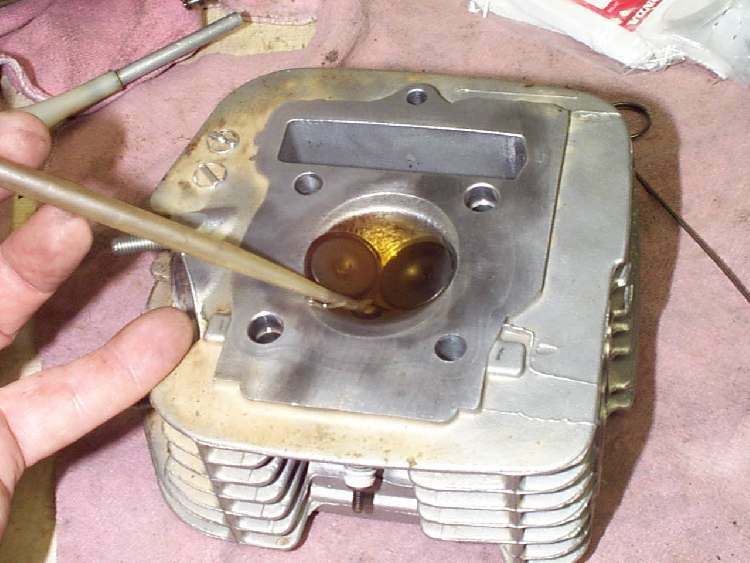 It only takes a small bit of goo or dirt to lodge in the valve seat and prevent your nice new valve from working.